Many More Fishing Tips Added 11 June 2015! Fish Tips to help Catch Good Carp! With over 15 years of carp fishing experience I have managed to pick up many tips and tricks that has helped me catch some very nice carp, as well as a few big ones! I have tried to cover a whole range of carp fishing tips, from Carp Rig Ideas to Baiting Tactics. I hope you find these carp tips useful. Over time, I will try to add more fishing tips to this page when I get time. If you have any carp tips you would like to share with our community, feel free to send them to - Click Here to Contact Us! Here is a list of carp fishing tips to help you Catch More Big Carp. 1. If you can, try to locate the fish before choosing a peg. Locating the carp, or any possible patrolling area is a largest part of carp fishing success. 2. Use fishmeal-based boilies during the summer and autumn, try 50/50 mixes or bird food types of bait during winter and spring. 3. Add plenty of salt to particle baits, especially the cooked types like hemp, maize, tares, beans, partiblend seeds, maple peas and chick peas. Carp love the taste of salty foods. As a rough guide, add one tablespoon of salt to 5 litres dry particles. These are also good cheap baits to use! 4. Try adding chillies to some particle baits. Carp seem to love that hot "kick" from those spices. Roughly add 2 tablespoons to 5 litres particles. 6. When the water is cold such as in the winter, try casting your rigs a little more frequently, and target different areas in order to place a hook bait close to the fish. Cold water slows down the movements of carp so there's less chance the fish will swim towards your bait. In the summer, you can lay traps in possible patrolling areas and wait for the carp to find the bait. 7. Use different sizes of pellets or particles in a spod mix. This helps confuse the carp, it also gives you the option to use various sizes on the hook. 8. Add high sources of vitamin C to your bait. I often mix my method up using orange juice rather than lake water. You can also try soaking fresh boilies in orange juice in order to give that distinct flavour and extra sugar. 9. If you're worried about overfeeding the swim then use breadcrumb ground-bait with just the attractants added but without all the particle baits included. this way you get all the attraction without filling the fish. 10. Whenever you can, try to stay away from using round bait. 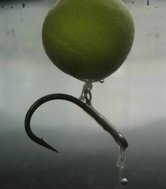 Far too many carp are caught on round baits, you want to be different. I sometimes just square up the hook bait using small scissors. 11. Try crumbling a multi-vitamin pill into your method mix. Carp love highly nutritious foods! 12. If you're fishing a new water, try using brightly coloured bait with high attract smells. Only switch if you know there are carp in the swim and you are having no action. 13. Try to get carp competing for the bait. When carp compete for food they lower their guard and are easier to catch. 14. In the winter, try fishing the silt areas at the bottom of gravel bars. 15. Always try to camouflage your end tackle to suit the lake bed you're fishing on. I sometimes weight down a spod with leads, then cast it out and let it sink to the bottom, then scrap up a sample of the bottom. I can then create my end tackle to suit the same colour. If possible, I try to do this a few days before a fishing session. 16. Always use good quality bait when fishing for big carp. 17. If you're catching carp in a certain spot then you want to place your rigs in the exact same spot every time you cast. To help do this, place some marker line or a small piece of tape on the main line once you have the rig in your preferred area. 18. Rather than throwing unused particle baits into the lake at the end of the session, take them home and freeze them. Many particles such as hemp, maize, chick peas and beans can be frozen and kept, even maggots can be frozen and used for another carping session. 19. To help stop a banked carp from jumping around when trying to remove the hook, try covering up the eyes with a wet, dark cloth. 20. 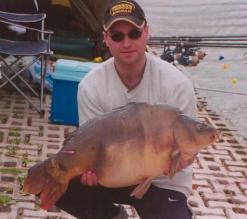 Try not to throw out too much bait at the start of a session, try the "little and often approach". Remember you cannot take out what has already gone in! 21. Try not to overfill a spod it will cause spillage in mid flight. It may also alter the course of the spod. 22. If fishing a pressured venue, don't add too many bright baits to your spod mix Bright colours often spook shy carp, only try out the bright colours if the neutral colours don't work. 23. In cold weather try soaking hook bait in neat liquid flavourings. These are usually much stronger helping to release attractant over a longer period. 24. To help locate the distance of the fish in the swim, fish with tight lines and stagger the rods at various distances. If you get line bites on the rod closest to the bank, then you know you're fishing too far with the other rods. 25. Tiny seeds used in any spod mix can help hold carp in a swim for longer. I believe some of the seeds become wedged or hidden in the lake bed and as a result, it takes longer for the carp to find the majority of these particles. However, do your research as not all seeds are effective for catching huge carp! 26. If you want to achieve more bites when fishing for carp, try scaling down on your end rig tackle. Smaller item of rig tackle are less visible but also, smaller hooks are often sharper because the wire is thinner. Sharp hooks always catch more carp out! 27. Always use Rock Salt over normal table salt when preparing particles or making your own baits. There is evidence which suggests carp are far more attracted to rock salt. 28. Do not always follow the wind for locating carp. Smaller waters are less affected by winds. Also, some of the bigger carp in larger waters may NOT follow the wind because angling pressure has taught them it could be dangerous! 29. Always plop in a few baits before casting out a rig. If there are carp feeding in your swim then the bait dropping down will cause them to move away for a while, then fire out your rig. It's much better to spook carp with bait rather than a heavy rig! 30. If the majority of anglers on your local water bait heavy and bivvy up for days, then try roaming or stalking tactics. Maybe place small patches of bait in different margin areas around the lake. Frequently visit these areas and try dropping our a rig. More Carp Fishing Tips Have Been Added Here! Will Heavy Rain Affect a Carp Feeding Habits? Will All Carp in a Lake Follow a Strong Wind? Q & A I Cannot Catch Carp! Do we really need to worry about the type of rig used?